UPDATE: I blanked on the fact Popular Gusts wrote about The Kim Sisters just a few months ago, with some interesting background, including a link to this history of camptown entertainment. In my Korean Popular Culture class, during our history lecture, the professor mentioned "The Kim Sisters" - a group whose name came up not long ago on tumblr as well. In trying to connect the music being created in Korea during the 1920s 30s and 40s, heavily influenced by Japanese colonialism (Japanese Enka is often mentioned as the musical ancestor to older Korean musical styles like Trot and Bbong-chak) and the US influenced rock and protest songs of the 70s and 80s, the professor draws a line through US military camp entertainment venues, where performers auditioned (echoes of modern Kpop? perhaps, though I think that's a reach), and where performing in the style American soldiers expected, was their meal ticket. A lot of Korea's most memorable performers of the era - including Shin Joong-hyun and Jo Yong-pil, developed their chops on the army bases. The Kim Sisters came a bit before Shin Joong-hyun and many of the others. They developed an act in the '50s as kids, which became polished enough to garner an invitation to an act in Las Vegas in 1959 (source), and were a big hit in the 1960s, appearing on the Ed Sullivan show 25 times - only 9 acts ever had more. Now Ed Sullivan is kind of a big deal... yet my mother-in-law had never heard of The Kim Sisters. Their mother was Lee Nan-Young, whose song "Tears of Mokpo" is one of the classic Korean standards: it's like "Someone to Watch Over Me" in that everybody's done this song. You've heard it in a taxi, your mother-in-law sang it in the noraebang, and one of the singers did a version on the latest music audition show. In the Korea Times interview, former member Mia Kim admits that her group's timing was perfect: "When we started our career in the U.S., there were no Oriental acts as such. We were the first Oriental band that could play Western music and was good at it." They were the right act at the right time. The early 1960s was also the time when the Japanese song "Sukiyaki" hit number one in the USA (1963)... so maybe there was something in the air... it was well before the Beatles brought Indian culture into hippie culture ('68), and at first google, the early 60s was a relatively quiet time for Asian-Americans, especially compared to the black civil rights movement (Rosa Parks kept her seat in 1955 and MLK met President Kennedy in 1960, around the time The Kim Sisters were putting bums in Vegas seats)... so it's hard to fit their invitation to perform in Vegas into a framework other than putting Orientalism on display -- at least from the demand side. However, getting on Ed Sullivan once ain't chopped liver, and they were invited 25 times - clearly more than a novelty act could ever muster. It would be worth further investigation. And I really don't mean to take away from what they had going, The Kim Sisters were incredibly talented performers, able to play 20 different instruments between them, and if you watch the videos, able to sing very much in the style of Western pop groups of the time, which is interesting in its own way: the way the sisters balance their Oriental-ness (tossing a few Korean words into a song) with their very Western vocal and performance style, actually reminds me of current Korean acts trying to make it in the US, working to hit that exact balance of being similar to US pop, but not too similar, and different... but not too different. (Do we sing in English? Do we powder our skin paler or apply bronzer? Do we apply eye make-up to look more round, or more slanted? Do we change our dances? Do we harmonize with intervals from Korean music or Western music? Do these people even know what Gangnam is?) 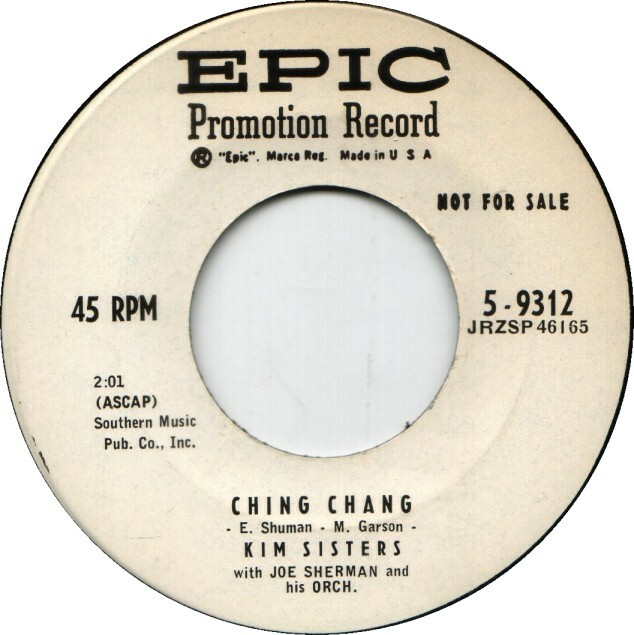 The Kim Sisters couldn't completely escape the pressure to put their Asian-ness on display: the b-side of their single "Harbor Lights" was a song titled "Ching Chang," written by E Shuman and M Garson. Sigh. I haven't been able to find the lyrics or a recording of the song online yet. Watch the sisters. Just watch them. I'm interested in the subtexts of their performances - the fact they were partly chosen, as per the interview, because "there were no Oriental acts as such" ... but also because they 'could play Western music and was good at it" (and they really were). The way The Kim Sisters perform Korean-ness is interesting, and could be contrasted with, the ways The Wonder Girls, Psy, Rain, or Lee Byung-hun choose to emphasize or de-emphasize their Korean-ness, in order, themselves, to hit that right balance of different, but not too different, that is necessary for a pop act to distinguish itself, and the balance between foreign and maybe exotic, but not other, that a foreign act must strike. Here are some of their performances from Youtube. With Lee Nan-Young, the mother of the two sisters, and aunt of the third member. Note the make-up emphasizing their darker skin and eye shape, and that their mother doesn't solo in English, but dresses in American styles. They play instruments in this one, and dance in unison.. but the way they move is pretty clearly modeled on Western pop girl groups. Starting in Hanbok, with traditional instruments, and then stripping it off to sing in English... interesting images. A very interesting study would be to compare the versions of Kpop videos for different audiences: what do the changes from The Korean Version of Bring the Boys Out to The American/English version show us about their company's expectations of the American market, or their perception of their members' strengths for the new market. This is another video where the version marketed to American audiences is different from the one sold to Asians (a version which still features some white actors though). The difference between the versions of "Bar Bar Bar" by Crayon Pop, meant for the domestic, and then the utterly unnecessary one for "global" audiences is interesting too... and kind of clumsy. I might write that up in more detail later. thanks for the praise. Instead of feeling ashamed, pick up a book or five! It might make you more proud of yourself AND your country.